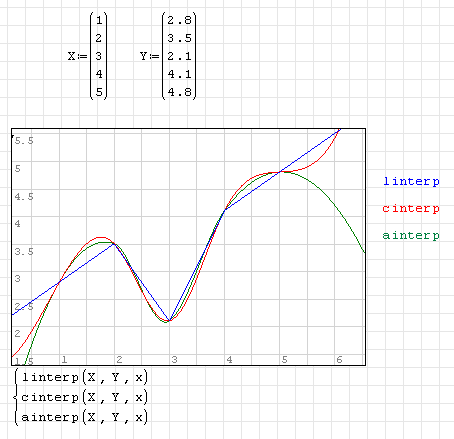 linterp('X-vector','Y-vector','x') - Returns a linearly interpolated value at x for data vectors X-vector and Y-vector of the same size. 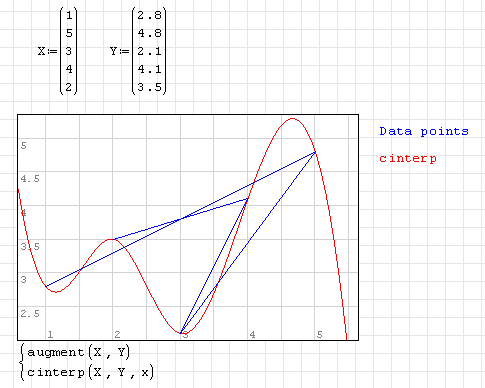 cinterp('X-vector','Y-vector','x') - Returns a cubic spline interpolated value at x for data vectors X-vector and Y-vector of the same size. 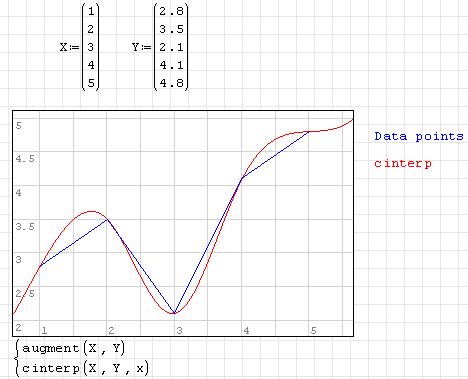 ainterp('X-vector','Y-vector','x') - Returns Akima-spline interpolated value at x for data vectors X-vector and Y-vector of the same size. Notice how misleading all of these functions are outside the limits of the original datapoints, ie below x=1 and above x=5. Try and make sure that you only use these for interpolation, not extrapolation.